February 25, 2018 - Sometimes we have to jump through a few hoops in order to make an adventure happen, and today was one of those days. There are many spectacular old movie theaters in downtown Los Angeles, but they're not open for public tours. One of these is the United Artists Theater located within the Ace Hotel Downtown Los Angeles. The hotel was originally built as the United Artists Building and was later known as the Texaco Building. The style of this 1927 building is Spanish Gothic, which was patterned after Segovia Cathedral in Segovia, Spain. As we walked around the building we spotted some graffiti art by Banksy, protected by Plexiglas. The United Artists Theater was designed to be the flagship of the United Artists film studio formed by D. W. Griffith, Charlie Chaplin, Douglas Fairbanks and Mary Pickford. The theater occupies three floors of the 13-story building and it has a 1,600-seat auditorium. Today there was an event at the theater, so we bought a couple of tickets to the event that really didn't interest us but, we got to see the theater in all its glory, starting with the lobby. Once the theater opened up for patrons, we were transported back in time and we gazed in awe at its opulence. I believe this is Mary Pickford. We originally planned to eat at one of the restaurants in the Ace Hotel but, their web site didn't post any of the menus for the various restaurants there. So, rather than taking a big chance on what probably would have been an expensive bill, we decided to have lunch at Philippe's in downtown Los Angeles. We both had their "double dipped" French roast beef sandwiches with potato salad, pickled egg, lemonade and custard pudding for dessert. It's always a hit! When we started our adventure this morning, we had everything planned for the day, including our evening snack. On the way into LA this morning we stopped at the Donut Man in Glendora to pick up our treat for later. 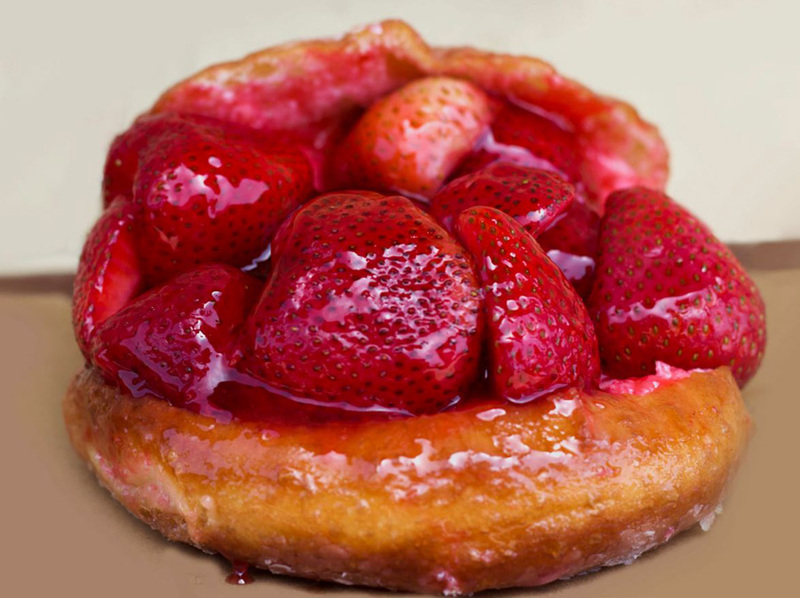 Fresh strawberries are now in season and the Donut Man's fresh strawberry doughnuts are out of this world! We're looking forward to tossing down these babies tonight!